For many citizens a line had been crossed inspiring thousands from across the political spectrum traveling to Standing Rock and joining the resistance to Dakota Access Pipeline. This story follows the experience of a few of those citizens from Milwaukee, Wisconsin with members of the Overpass Light Brigade and Michael Bootzin making for this "brew city" journey into water protecting. A glimpse into our future with an inside look into activism at Standing Rock. In the Spring of 2016, the call went out, no one would have guessed that by November the camp would grow and the movement would gain so much support around the world. This is largely because of the independent media, without them the world would not have had the opportunity to participate and the brutality of the militarized police may have only been known to those fighting on the front lines. This film is a glimpse into our future. 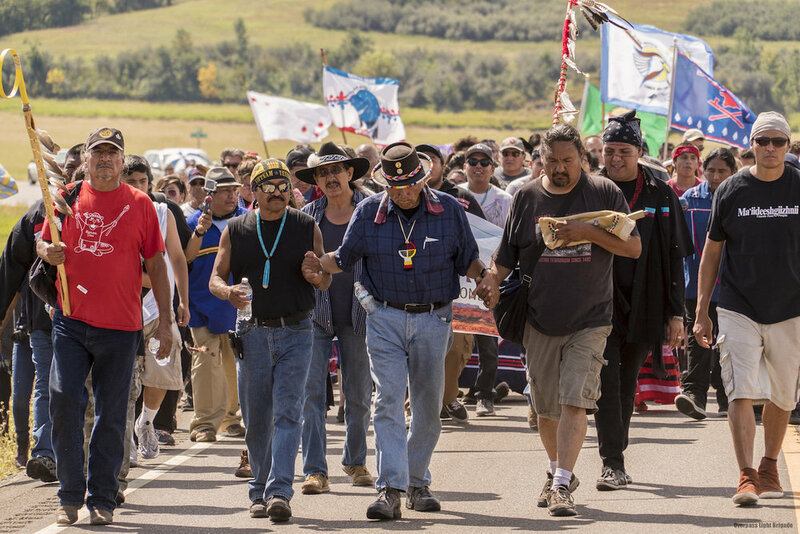 Over 850 citizens were arrested during this resistance to protect the water. The fight is not over, the sacred fire has been kicked out, but the embers have traveled the world and are again ablaze! Today water protectors can be found in cities everywhere including Water Protectors of Milwaukee as Native Americans lead the important challenges to protect our environment. The story of Standing Rock is our future. How we treat the environment and each other is our destiny. Denny Rauen known as one of the nations finest luthiers began his social activism in the late 60's and continues to this day. Bringing attention to the many decisions and actions around environmental and health issues Denny’s unvarnished "guerrilla" short films continue to shine a light. "Being there is the best and sometimes the only way to understand an issue", raising social consciousness is the target. Today he is a regular participant with the Overpass Light Brigade and made two trips with OLB in support of the Standing Rock Sioux #noDAPL struggle. Photography courtesy of Shanna Wolf. Michael Bootzin is a community mentor and volunteer as well as a music teacher, arranger, and performer. An activist for many years his work includes refugee camps in Burma, Thailand, Gaza and Bethlehem also work with Indian Council for the Elderly. Michael obtained his professional schooling through "The Wisconsin Conservatory of Music," "Berklee College of Music," "UW-Milwaukee," and "MATC." His social activism has been an important part of his life's work. Michael spent December 2016 through January 2017 at Oceti Sakowin in support of the standing Rock Sioux. The Overpass Light Brigade was forged in the activist climate of the Wisconsin Uprising. Their messages shine at night over highways and other public spaces. There's a believe in the power of communities coming together in physical space, as well as the importance of visibility for grassroots and progressive causes. "We are a loose and inclusive affiliation of people dedicated to the power of peaceful protest and artful activism". Photography courtesy of Joe Brusky.